Late last year I built a number of elements for the National Maritime Museum in Sydney for their “Container” exhibition. Including a 1.8m long blue whale. Here are some shots and explanation of the building process. The original Client reference image, it need to be flipped to suit the location. The rough shape cut out from a block of urethane foam. Note the small model also supplied for reference. Here the shaped whale has been covered with a layer of 300gram fibreglass mat and resin. It was then sanded and multiple layers of automotive putty applied and sanded back. The eye detail was carved from the auto putty before it cured. In a small window of time it can be carved, somewhat like a block of cheese. Additional shaping was achieved with an air drill before final sanding. The fin is a sheet of high density MDF sanded and shaped. 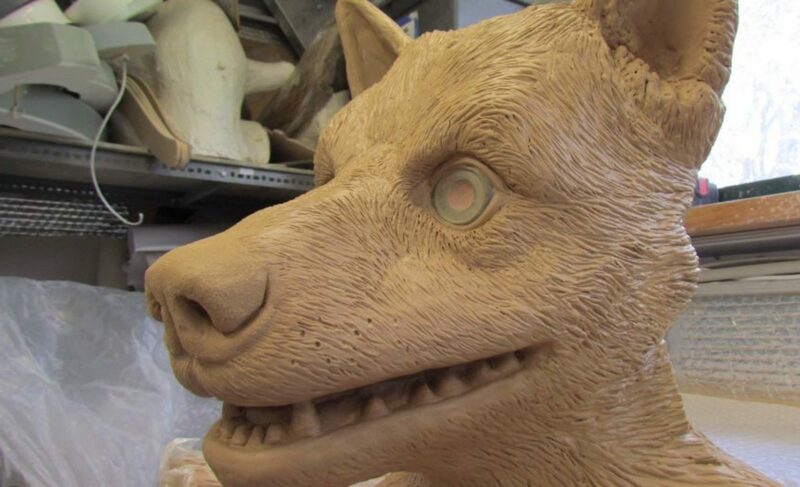 The skin texture under the mouth is again carved (in sections) into the un-cured putty. The fluke is made from laminated sheets of high density MDF first shaped on a belt sander to give it some organic curves, then hand sanded sanded and attached. Once all the detail was resolved a few layers of primer putty were sprayed on, with sanding between each layer. The whale was finished with a coat of a grey blue and detailed by airbrushing the skin patterning. The whole unit was sealed with a low sheen auto acrylic clear coat. Finally a metal plate was added for fixing the unit to the wall.